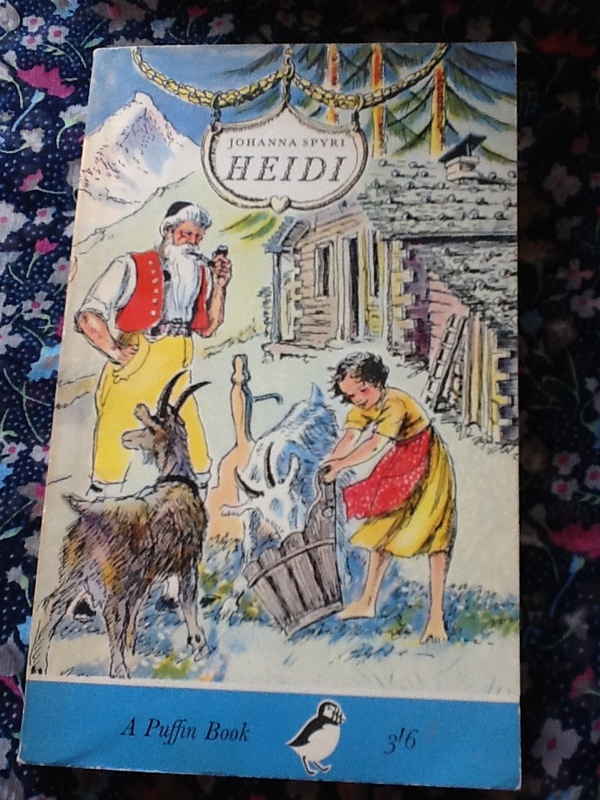 This pretty Puffin edition of Heidi with the price of 3/6d on the cover was irresistible. It goes on my (growing) pile of books from childhood to be revisited. 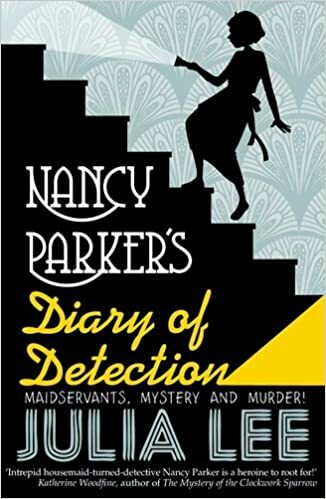 I’m not sure I would have been drawn to reread Heidi (I have a vague feeling there is something a bit goody-goody about the story – though I may be wrong) had it not been for this delightful cover by Cecil Leslie. It’s colourful and delicate and full of sprightly movement. Heidi’s grandfather has a luxuriant Father Christmas beard, the goats are truly goat-like, and Heidi’s are toes are spread out on the Alpine meadow in a way that reminds me how wonderful it is to go barefoot in soft grass. There are further line illustrations inside. As far as I can work out this edition is from 1956, my copy being one reprinted in 1964. The pages are quite yellow but the spine is unbroken. I must have read Heidi several times as a child. It was one of those books that was around a lot, that everyone read, almost without choosing to – because everyone else had read it. I’ve just looked up its background: it was first published in 1880 and is one of the best-selling books ever written. It has been filmed and televised a number of times, including a 1937 movie with child-star Shirley Temple in the lead role. So it was well-known to our mothers and grandmothers, too. Cecil Leslie, it turns out, was a woman, and illustrated a number of E Nesbit books for Puffin. She also illustrated Alison Uttley stories, and Pauline Clarke’s fascinating tale of what happened to the toy soldiers once owned by the Bronte children, The Twelve and The Genii. 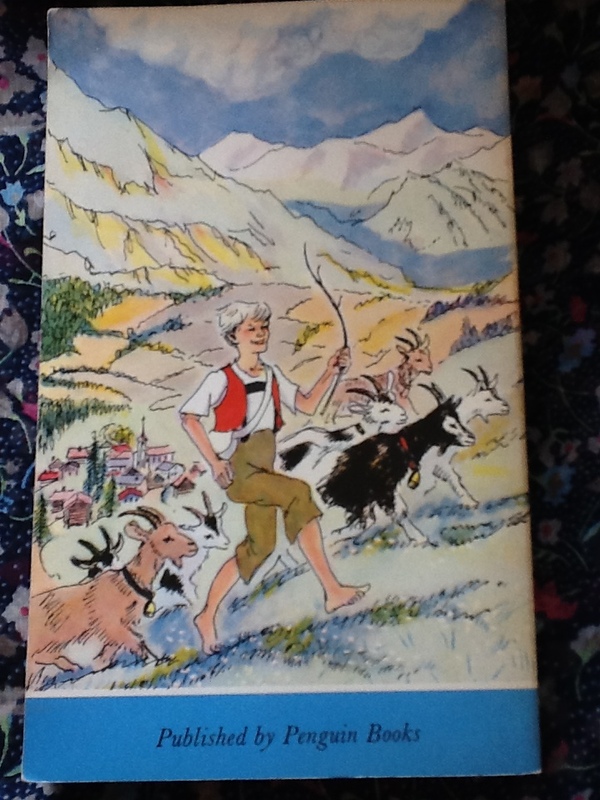 I’ve re-read ‘Heidi’ recently because I loved it as a child and also because was one of the books children growing up in 1930s Germany would have been very familiar with, and I wanted to read something one of my characters would have read. Your instinct about wheelchairs and mountains is spot on! I love the edition you have, and the gorgeous cover! Anne – It cost me the princely sum of £1.50! What a bargain. This was exactly the edition I had and loved to destruction! You don’t remember what happened to the wheel chair…??? I was scarred for life! That was exactly my copy, so pretty, yes and the wonderful prehensile toes – much more useful on a mountain! Now I’m quite excited about rereading, Lizza. Things can only go wrong, can’t they – but fingers crossed for them going right?! Quite a few people recognise this fabulous cover. It’s all very nostalgic.